Being 2000 mm long, 805 mm wide and 1155 mm tall, the Beta RR 50 Motarad Track is a pretty compact motorcycle that thanks to its small stature can be fairly easy to handle on various types of terrains. At the heart of the motorcycle sits a 49,7 cc, single cylinder, 2 stroke, liquid cooled engine with lamellar induction in the crankcase. The engine is linked to a six speed transmission with wet, multi-disc clutch and is fueled by a 6.5 liters fuel tank. The Beta RR 50 Motard Track rides on a front R16V USD fork (41 mm) and a rear swingarm made of black steel. As far as wheels are concerned, the Beta RR 50 Motard Track sits on 17 inch rims shod in 100/80 – 17 front and 130/70 – 17 rear tyres. Hit the jump for more information on the Beta RR 50 Motard Track. 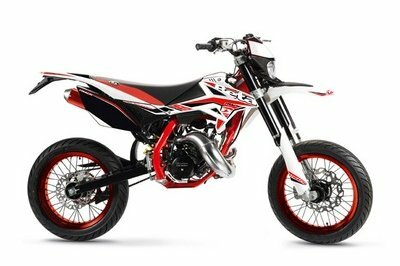 The RR 50, reigning Europoan Enduro Champion, will change tech specs and design for 2014. Just the capacity of 50 cc remains, the rest will become much more motorcycle than moped. The models will combine excellent handling and stability, a great riding experience and a spectacular new look. • New decal in new graphic design which will distinguish the new 50 cc range from the previous ones. • New front mudguard, for all 50 cc, more resistant and better debris protection. • Red frame for the top end models RR Enduro Factory and RR Motard Track. • New microfused footpegs, light and rigid, for RR Enduro Factory and RR Motard Track. • Rear swingarm in black steel, for RR Supermotard e RR Enduro Standard (entry level), creating a new racing look. • Front fork R16V – diameter 41mm - USD - for RR Motard Track; additionally in adjustable version for RR Enduro Factory. • Conical 28, 5 mm handlebar for RR Enduro Factory and RR Motard Track. 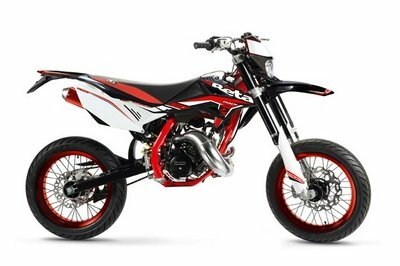 • RR Enduro Factory and RR Motard Track offer an exhaust with nickel coating and a silencer in red alloy in order to complete the sharp dress. • Alloy cast wheels with 5 spokes for the classic RR Supermotard and Standard and spoke wheels with red rims for RR Supermotard Track. Fuel tank capacity 6,5 l.